DJ is back with the eighth phrase in the swing blues solo. The second phrase of the 3rd chorus incorporates hammer-ons. Learn what makes a chord progression a blues progression as well as the basics to the famous 12 bar blues. Now that you've learned the 12 bar blues and some rhythmic variations, it's time to throw in some chord variations. Time to take a break from the 12 bar blues and start mastering some lead techniques. This all starts with the minor pentatonic scale. Now that you've learned the minor pentatonic scale, it's time to learn how to move it around. Now that you've mastered some SRV, DJ is going to show you some funky blues rhythms that use the 9th chords. DJ begins a discussion of the minor pentatonic scale patterns. He demonstrates the A minor pentatonic scale in first or "open" position. Continuing on with the minor pentatonic scale, DJ covers the second position. As with lesson 9, he provides a few exercises and riffs along the way. Continuing with the A minor pentatonic scale, DJ returns with a lesson on the fifth position pattern. In this lesson, DJ covers the A minor pentatonic scale in 7th position. He includes licks and riffs to help with skill building. This lesson covers the 9th position of the A minor pentatonic scale. DJ provides licks, riffs, and a string skipping exercise. Now that DJ has covered all five patterns of the minor pentatonic scale, he explains how to shift from one pattern to the next. Now that DJ has covered the minor pentatonic positions, he shifts gears to the major pentatonic scale. In this lesson, DJ demonstrates a number of major pentatonic licks that feature position shifts. DJ demonstrates how to combine the major and minor pentatonic scales. 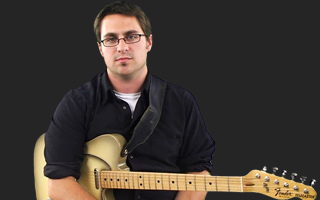 He provides a number of combined scale licks for you to learn. DJ talks about the art of improvising in this lesson. Always begin with a grand entrance and end with a big finish. DJ begins a discussion of colorful dominant chord voicings. He demonstrates how to build chords from a root note on the 6th string. Continuing on from lesson 21, DJ explains how to build dominant chords from root notes on the 4th and 5th strings. In lesson 23, DJ demonstrates how various chord voicings can be used while playing rhythm or lead over a 12 bar blues progression. With lesson 24, DJ begins a short segment on tricks of the trade. First, he discusses and demonstrates string rakes. Continuing with his "tricks of the trade" lessons, DJ demonstrates a walking bass line and the upstroke shuffle. DJ discusses and demonstrates natural, artificial (harp), and pinch harmonics in the blues style. Building on his minor blues set, DJ discusses how to utilize the dominant V7 chord to spice up the standard progression. DJ demonstrates a couple turnaround techniques that can be applied to the 12 bar minor blues progression. In this lesson, DJ discusses some minor 7 voicings with roots on the 6th, 5th, and 4th strings. Much like lesson 35, DJ discusses minor 6th chord voicings with roots on the 6th, 5th, and 4th strings. DJ explains how altered extensions such as the b9 and #9 can be added to the V7 chord within the context of a minor blues progression. In this lesson, DJ builds upon lesson 38 and covers the minor scale positions across the entire fretboard. DJ is back with Phrase #2 of the Swing Blues Solo. This lick is designed to outline the IV chord. DJ is back with another phrase of his swing blues solo. The third phrase of the first solo is also your first turnaround. In this lick, you'll outline the chords that bring us back to the top of the form. The fourth phrase of your first solo has a lot of pentatonic influence in it. You've also climbed the neck to the upper register to help build your solo. We're back to the second phrase in the long form blues again. This lick picks up where the last left off and continues to build suspense in the upper register. DJ is back with the sixth phrase of his Swing Blues Solo. We're now at the second turnaround of the long form. This lick incorporates chromaticism to build tension. We're back to the top in the 3rd chorus of the blues solo. This lick starts to amp up the solo by adding more bends and a few double stops. DJ is back with the ninth phrase in the swing blues solo. For the third time, we find ourselves at the turnaround. This lick plays on the idea of a repeating figure followed up by a scale run. We really start to add some gusto to the solo for our final three phrases. This lick uses open stringed double stops and position shifting to create a long build up towards the solo's climax. The eleventh phrase of our long form blues solo continues to build on the previous phrase. This time you'll be using a repeated but slightly varied figure along with double stops to create more build-up. DJ is back with the final phrase of the swing blues solo. This turnaround lick uses quick bends, repeated figures, and a chromatic walk down to twist your ear before finally resolving back to E.
Dig into the second phrase of our straight blues solo! This one uses double stops, bends, and vibrato to kick the solo into high gear! The first turnaround in our straight blues solo uses a low walking melody along with a scale run that brings us back up to the top. As we return to the top for the second round of our long form, we hear a familiar melody. This one is stolen right from the last phrase, only it's been transposed up into a higher register. We're getting into the meat of this solo and it's time we started rocking! We amp up the energy by using some down picking and scale lines. We've now reached the second turnaround of our long form blues. This phrase gets a little funky with some position shifting and double stops. Here, we return to the top and continue the funky feel from the turnaround. This lick features chromatic runs with vibrato and a repeated figure. The next lick in our long form straight blues is all about syncopation and getting that dirty tone from the amp. Careful rhythmic placement of rests and the use of double stops help us accomplish this.